Most of us tend to only think about the Olympics every four years. That’s when we collectively tune in to watch athletes from all over the world push the boundaries of the human body and spirit. But we often forget that during the intervening years, athletes and organizers are working hard to make these events a future reality. In other words, there’s a whole industry of workers and athletes who make these Olympic games happen. In many ways, the sports industry is different than traditional corporate industries. However, when it comes to gender equality, some things sound very similar. I spoke to Angela Ruggiero, one of the three women on the Executive Board of the International Olympics Committee (IOC), about her own Olympian career. She filled me in on why she is helping the Los Angeles 2024 Olympic bid be the first Olympics Games to publicly commit to gender equality — and what that means. Ruggiero, one of the most prominent ice hockey players in the world, has had an incredible career. . A 4-time Olympian with the U.S. Olympic Ice Hockey Team, Ruggiero is a member of the 2015 Hockey Hall of Fame. She has worn the U.S. jersey in more games than any other person in the country’s hockey history. Gender equality in the sports industry is important to Ruggiero on a personal level. She’s currently busy as an entrepreneur starting a market-research company serving the sports industry, but she also holds a role as the Chief Strategy Officer of the Los Angeles 2024 Olympic bid and is one of the people leading the charge to make 2024 the first gender-equal games. The first thing I wanted to understand is how unique it is that Los Angeles is making a gender-equality commitment. To Ruggiero’s knowledge, no prior organizing committee for any city has made gender equality this kind of public priority. She told me that while the IOC is preparing a set of guidelines to be released towards the end of this year about gender equality for the Olympic games, there is currently no requirement that an organizing committee be gender-equal in the way the LA organizers are pledging. What, exactly, does gender equality mean for the LA organizing committee? It’s a very broad definition, taking into account much more than the obvious issue of female athletic participation (which currently stands at 45% in terms of the number of women athletes participating in the event). The parallel to employers who support women was apparent to me here, since the best companies for women do much more than just simply measure gender parity in employee numbers (though that is an important start). Ruggiero explained to me that gender-equal games for the LA organizers also means looking at funding levels and disparities between men and women athletes and making requests for changes where they need to be made. It also means looking at the HR side of the games and the staffing of the administrative employees for the games, as well asthe representation of women leaders there. To the organizers, gender equality also means logistical equality. For example, they want to ensure that women’s events will be given prime venue real estate rather than a smaller arena that’s located further out. They are also keeping an eye on things that are small but symbolic, such as whether women athletes will have equal access to things like changing rooms. Finally, and very importantly, the LA Games organizers are trying to make sure that women are represented equally in terms of media access and portrayal. While the organizers don’t have final control the broadcast choices that media outlets make, they do plan on organizing symposiums and discussions to share best practices about the importance of gender-balanced storytelling. The visibility of female athletes and role models is important because, as Ruggiero says, “sports is a big reflection of society.” In fact, Ruggerio told me a story about signing autographs for “boys who were excited to meet someone who was in the Sports Hall of Fame” and how she believes it is just as important for boys to see successful female athletes as it is for girls to see and engage with them. I believe the same role modeling effect is true of any field or role where leadership is dominated by men. It’s important that we all see women running companies, women serving on boards, and winning gold medals if we are to get to a gender-equal future . 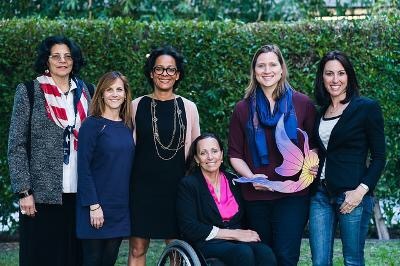 The vision of the LA 2024 games is about “connecting the Olympic movement to the future, to create new games for a new era.” It seems only fitting, then, that gender equality is part of the fabric of those games.